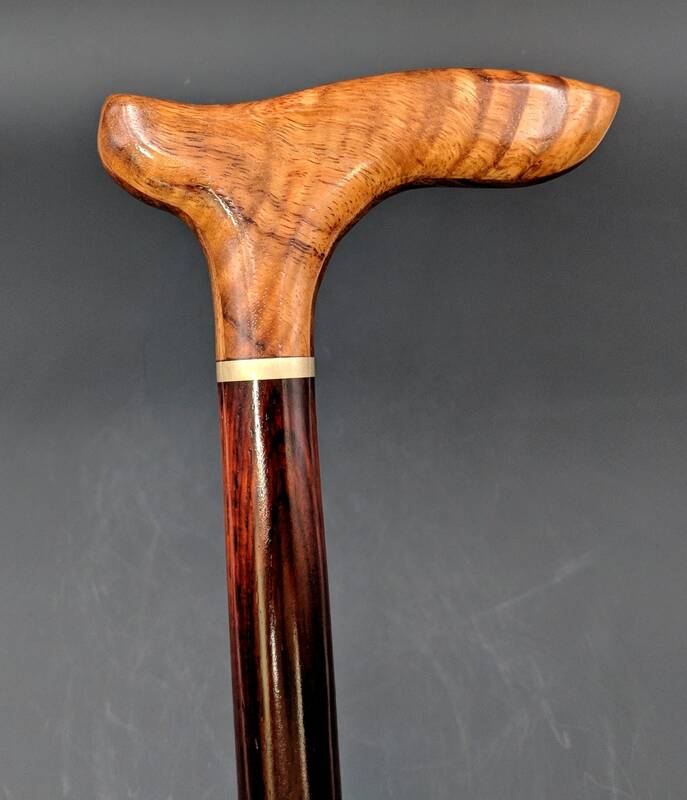 This Curly Hawaiian Koa Handled Cane is a true work of love. 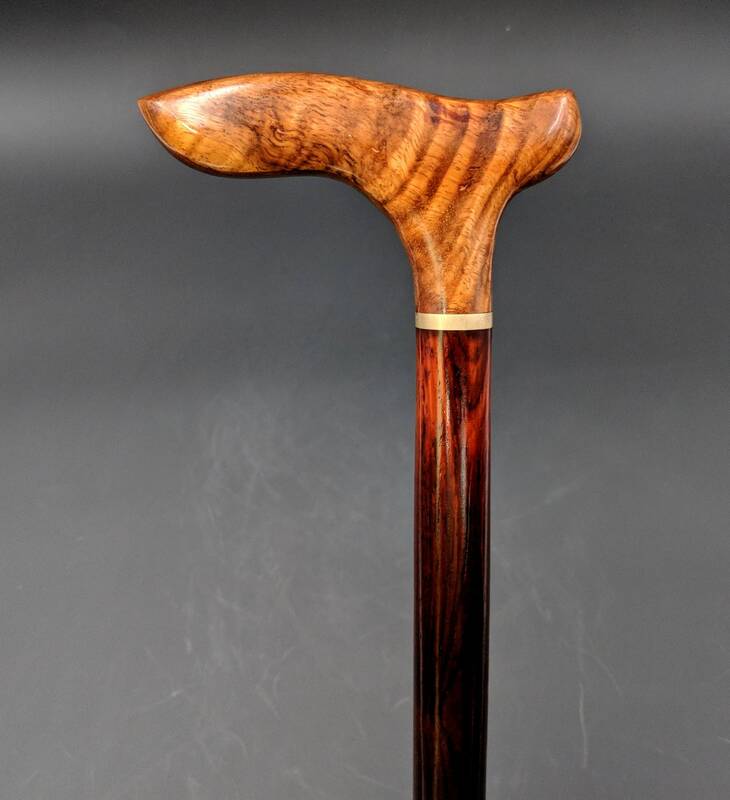 Koa wood is not as hard as a lot of people think and does not make a very good strong cane shaft as it tends to snap along grain lines and choosing the proper grain becomes a challenge.. Top cane makers usually use shafts from the Ebony or Rosewood families for their cane shafts. There are a lot of other good strong wood with straight grain patterns that make good shafts also such as Oak, Ipe, Maple and Mahogany just to name a few. 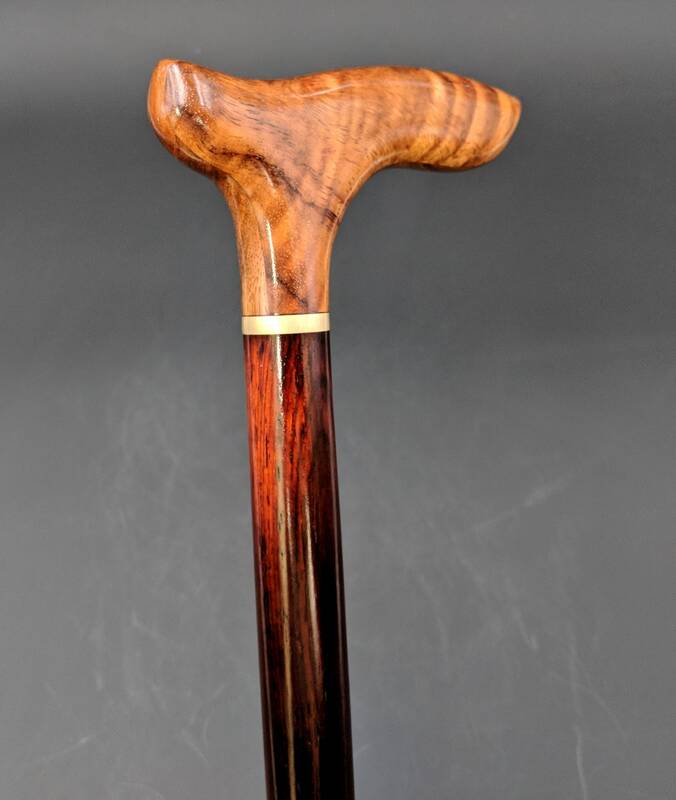 I matched this Curly Koa Handle I made out of two pieces of 3/8" Curly Hawaiian Koa and a center piece of Indian Rosewood for lamination strength with a Turned Straight shaft of B Central American Rosewood (Cocobolo) (Dalbergia Retusa ) . This Rosewood is grown in cultured plantations to sustain the resource. 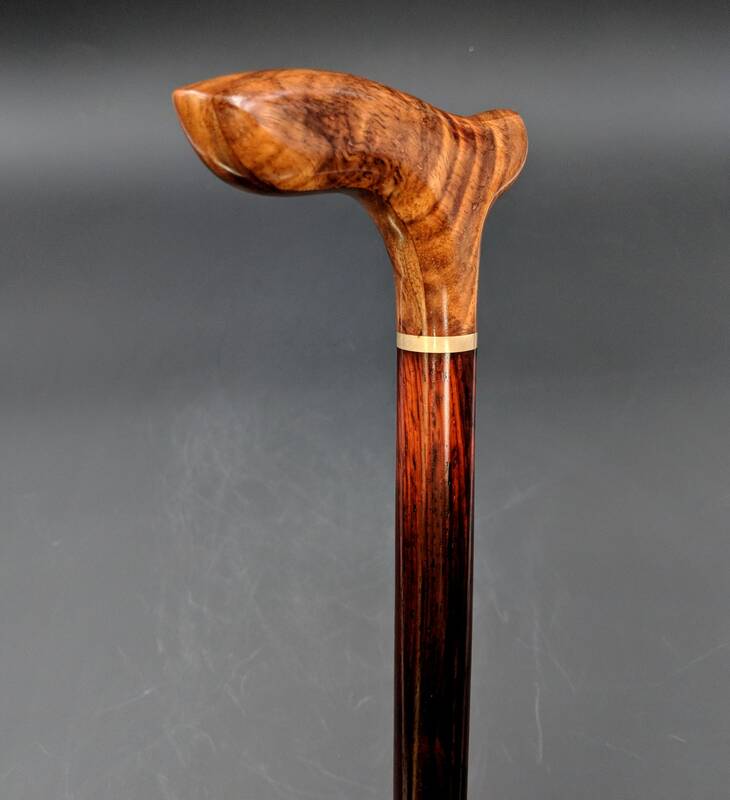 This cane is currently 35 5/8" but can be cut to a shorter length if desired. Shaft is turned on a lathe. The handle is 5" long and about 1" in diameter and made of two pieces of Hawaiian Curly Koa laminated with a piece of Rosewood for strength. The connection between the shaft and the handle is very important as extreme stress is put on the joint and is the major point of failure in cane construction. After years of experimenting with different methods of mounting the handles I have decided that the threaded rod connection makes the strongest connection possible. I use a 3/8 x 16 threaded steel rod to connect the two pieces. I first tap the handle hole and the shaft hole to the desired depth and then use epoxy to combine the handle to the shaft. I also use a 3/16" thick Solid Brass "washer' as a grain directional break which also accentuates the joint. This Solid Brass washer is one inch in diameter and has a 3/8" hole through the center where the threaded rod passes through. I don't use the brass tips for safety reasons as the rubber tips I get better grip the sidewalks and won't slip as easily as brass tips will. They also have a steel washer inside the rubber tip for longer wear and safety. 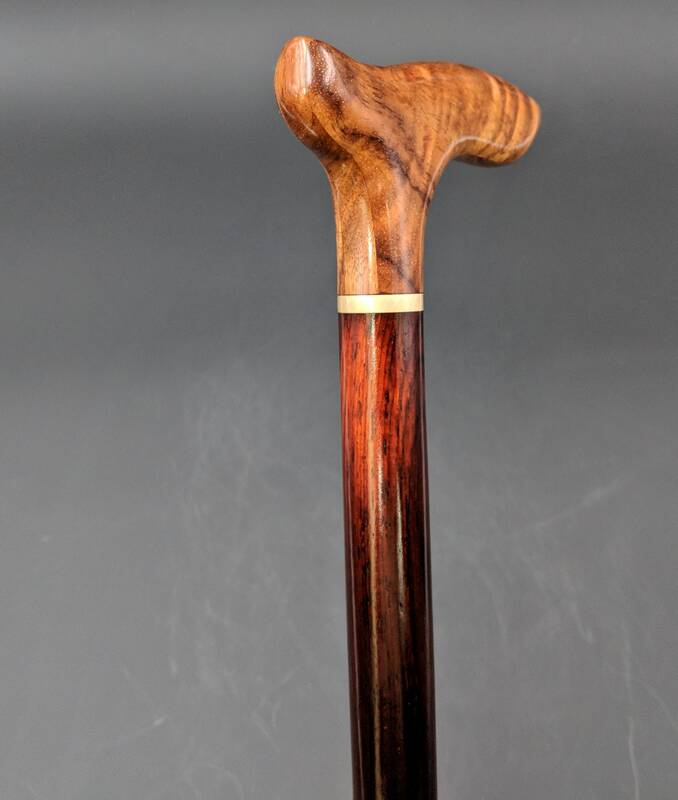 I am constantly making and finishing canes and I am sure I have something that you might be interested in. 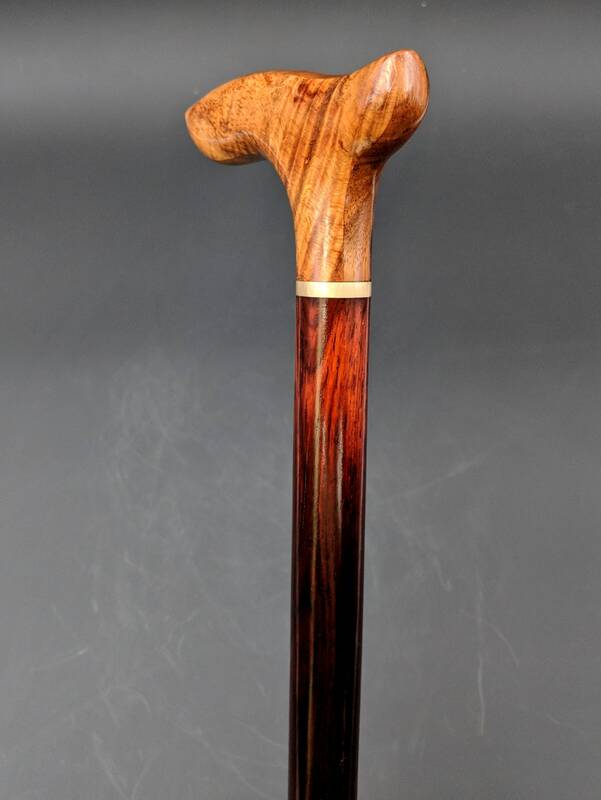 Feel free to contact me about a special cane that you might want. 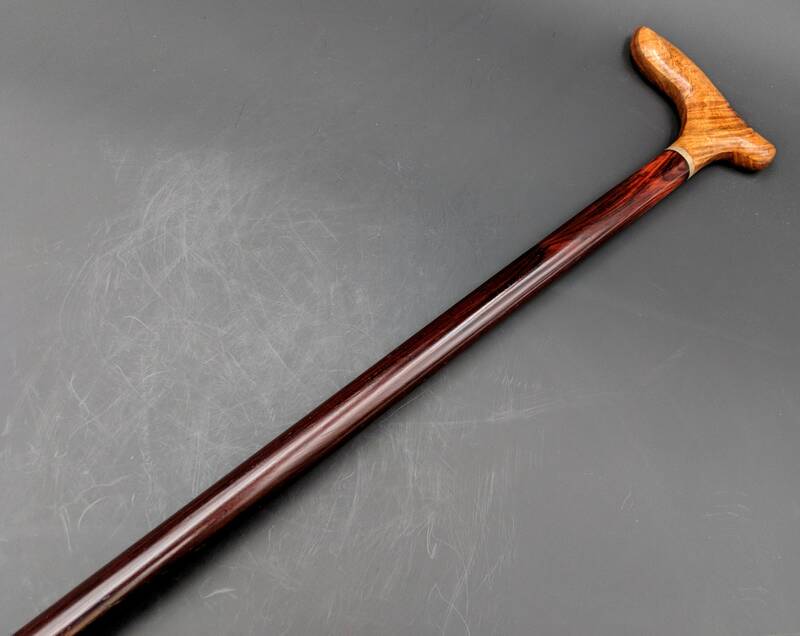 I guarantee all of my canes for my lifetime and if you are not happy with the cane I will take it back for any reason. Unfortunately I am over 70 so my guarantee may expire at any time !! Excess shipping will be refunded after I know the actual cost and all canes are shipped US Priority Mail. Feel free to ask any questions that you might have. 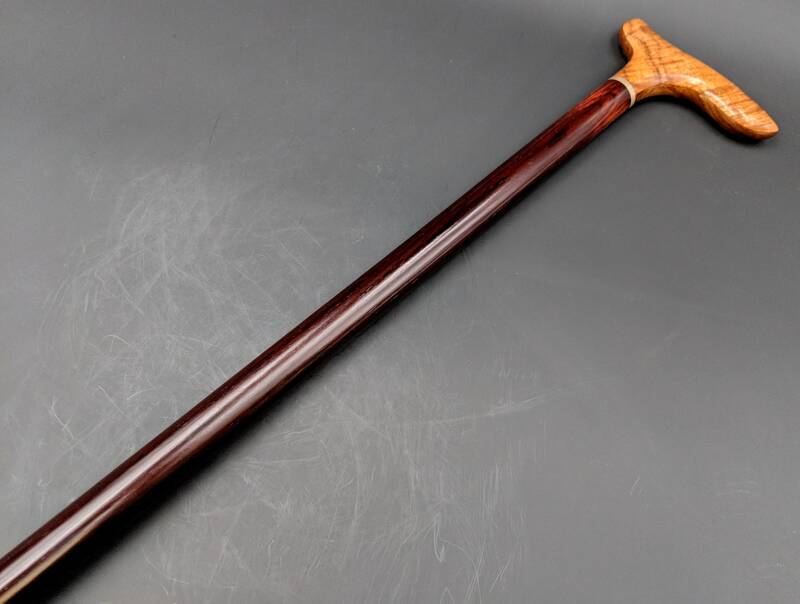 Nice sturdy cane with a very nice handle. Quick shipping. Would definitely buy again.